Because of the untold amounts of money I'm leaving for you to earn, many people are beginning to realize I'm offering, flat-out, the best resale rights package available on the internet. You see, I've done all the hard work. I've created a hot product, PopupReminder, which sells and has been proven to sell consistently over time. I have "tried-and-tested" marketing I paid a pretty penny for. The sales letter, the graphics, everything has been coordinated for maximum sales. I have a product which people use every day. My customers are loyal, appreciative, and depend on my product to further their productivity and success. In order to have this kind of business up-and-running, it usually takes thousands of dollars and months of precious time. But by offering you the resale rights, I'm letting you take it all off my hands! You get to call the product your own, alter it in any way, and keep all of the profits when you sell it. But like I said, the resale rights themselves aren't even the best part! After you purchase resale rights to PopupReminder, you'll be given 100% rights to sell this program as if it were your own. You keep all the profits! You'll also get to use the entire PopupReminder website, with the sales letters and graphics, we've created and market-tested to sell the product. We give you not only everything you need to start selling immediately, but everything we use to sell copies now. Best of all, on the bottom portion of the copies of PopupReminder you sell, you can put whatever you want. This is an incredible money making opportunity that's available for the first time in the world. Why is it so powerful to put whatever you want on the bottom of PopupReminder? 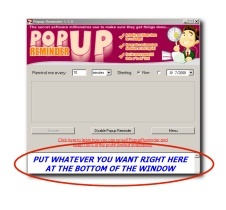 Unlike a normal "pop up" you'll find while browsing the web, people pay close attention to pop ups from PopupReminder. Like you, they've paid money for that "pop up" to keep them productive and away from distractions. We've discovered, to our surprise, the average user of PopupReminder sees the same little "pop up" literally hundreds of times in a single day! Imagine the power if you were to put something, such as an advertisement which will earn you money, on the copies of PopupReminder you'll sell! Every few minutes throughout the day, your customers will see YOUR ad "pop-up". YOUR ad will also be viewed whenever a customer changes the settings, or changes the "pop-up." No other advertising method can claim that their market has PAID to see a pop up! No other advertising method can claim to reach a single person hundreds of times in a single day, for as many days as you wish. The amount of money you could earn is staggering. To be clear, there are no advertisements like this on the copy of PopupReminder you purchase from this website, and there never will be. This is an opportunity YOU can take advantage of on the copies YOU sell. Your customers will be happy too, if your advertising is interesting and relevant to them. This unique opportunity to make money has been called "Customer Requested Pop-Up Advertising", and it's much different than any other form of advertising! The Pop-Up Advertisement People Pay You To View! Many people who think they know advertising become confused when their ad flops, because still haven't grasped the basics. The advertising is on a medium which was unrequested. Advertising we ask for, such as a catalogue we order, is exponentially more effective. The advertisement is only viewed once or twice, at best. Remarkably, it turns out it takes seven views of an advertisement in order for the average viewer to completely understand what the advertisement is selling. "Customer Requested Pop-Up Advertising", only available with the resale rights to PopupReminder, amazingly has none of these problems. Advertisers, you can imagine, are beginning to check their pulse! You'd be advertising to a pre-selected market. The only people who will see your ad are people with disposable income, who are also willing to purchase products based on sales letters. Having already purchased, and therefore put their faith in, PopupReminder, your market will be more inclined to view your ad, since it will be on the program itself. Your advertising would actually be asked for! Unlike the "pop-ups" that intrude when you browse the web, which everybody finds annoying and quickly closes, "pop-ups" from PopupReminder are paid attention to. Basically, PopupReminder users paid $39.95 to stare at the pop-up. Your advertisement could not be in a more valuable place. Your advertising would be seen, by a single person, as many times as you need. Unlike most advertising, which is viewed only once per person, PopupReminder will guarantee your advertisement is seen by the same person as many times as necessary. This is something no other advertising medium can guarantee. Harness Even More Traffic From Your Ad. You Can Use Color, Pictures, Audio, Video, Even Adobe "Flash"! This gives "Customer Requested Pop-Up Advertising" the potential to be really explosive! I have no idea how much money this could earn, because I haven't tried it yet! On my copies of PopupReminder, I just put a simple link to this page, the resale rights page, on the bottom of the program. It's been shown, however, that multimedia, especially used creatively, draws a lot more traffic than a simple link. On the copies of PopupReminder that you will be selling, you're able to use colored text, images, or even Adobe "Flash" to strengthen your ad. So not only will you have ideal advertising space, you'll also have amazing looking ads that will grab people immediately. Not only do you earn 100 percent of the profits by selling this already-made, already-successful product. . . .
Not only do you have a uniquely powerful advertising tool that advertisers would kill for, but you can use to make huge amounts of money. . . I'm actually letting you make money without doing anything! I let you re-brand PopupReminder with your own affiliate ID. Then, when your customers buy PopupReminder from you, our systems will automatically send them emails. Here's the best part: If one of your customers purchases the resale rights, you will make a 50% commission! Our follow-up system will keep on selling, meaning you'll have yet another consistent income stream, along with your advertising earnings and profits from reselling PopupReminder. The "advertising gold mine" alone makes this resale rights package better than any other now available on internet. The Revolutionary "Customer Requested Pop-Up Advertising", Advertising That Could Potentially Earn You Millions - Put ads on the copies of PopupReminder you sell, and you have yourself an advertising "gold mine". I haven't used this to its full potential by any stretch of the imagination. You can even use multimedia, images, sound, Adobe "Flash", in your ad to draw in massive traffic to an affiliate and earn untold amounts of money online. Rights To A Program With Real Value - This is not a valueless free program, shareware, or a partial version. With the resale rights you get the absolutely full version, the same version I sell for $39.95. I also guarantee that the value of the product will remain $39.95 or higher. No one, including myself, is allowed to sell it at below $39.95. This secures your product's value for life. The Ability To Start Earning Money Today - Anyone can promise profits "quickly". But do they deliver? Unlike virtually every other way of making money on the internet, with resale rights you don't have to wait to start. You can download everything you need in just a minute. Emails That Provide "Recurring Profit Streams" - In a spur-of-the-moment decision, we've decided to include a powerful sequence of emails we've been using ourselves to make a lot of money. This is huge. All you do is send these emails to the people who buy PopupReminder from you. These emails are proven to make additional sales in resale rights. Because of your affiliate ID, which is branded in the emails, any sales in resale rights coming from your customers will earn you 50 percent per sale. Basically, you earn money doing nothing! This "profit stream" will continue to occur as you focus on other areas of your sales. A Long-Term, Stable Income Source - Many ways of earning money on the internet are "tricks" that can only work once. At best, they work for a few months until other people catch on. Buying resale rights, on the other hand, gives you an entire product and website that will work for as long as the Internet exists. �� You know, a small amount of sales per day really adds up. Just think, if you sell only five copies per day at the minimum price possible, you'll make $72,908.75 per year! Free Unlimited Updates, Direct From Us To Your Customers - Every time we upgrade Popup Reminder, you will be granted resale rights to the new version. Additionally, your customers will be notified of the new version and they can download it too. This means that you don't have to worry about a thing on the software development side of things. Whether its fixing bugs or adding new features, we'll provide them to your customers directly so you don't have to think about it! For 60 Days, I'll Hand You Over A Clone of My Internet Business, Including The Keys To The New "Advertising Gold Mine", And Let You Keep All The Money You Make Even If You Ask Me For A Refund! For up to 60 days after you purchase our resale rights, you can actually go out and sell Popup Reminder, and keep 100% of the profits. If you aren't satisfied, you can ask for a full refund for the resale rights, but you get to keep the profits from your sales! This is better than a 100%, risk-free guarantee. This is letting you into my profits for 60 days. Absolutely all the risk is on my end! I can do this because I am so confident you're going to earn much more money continuing to use the resale rights than if you return them. No matter what the reason, during the 60 days you can get a refund. I won't ask any questions, we'll just give you your money back. It's rare that we have to give out refunds, but when we do, it's no nonsense, no hassle, and absolutely prompt. We're setting the bar for internet business transactions in terms of professionalism and value. Stepping Over The Line Of Common Decency? I made a very risky move when I decided on the price. Because I'm handing you over my entire internet business, the product, the website, the professional marketing, my business partners advised me to sell this for no less than $10,000. They didn't just pull this number out of a hat. $10,000 is price of comparable resale rights packages. This is not an inflated price to make the actual price seem lower. People will happily spend $10,000 or more on quality resale rights because owning an entire business pays for itself over and over again, in a matter of months. But call me stubborn, I brushed aside the usual, multi-thousand dollar prices. I wanted PopupReminder to be the biggest, most popular product I've ever conceived of, so I went ahead and made the price insanely low. As of right now, you're able to purchase the resale rights for only $297 $197! At this price, I shouldn't have to convince you further. Plenty of people are already checking "order" right now and starting to make money. I want to remind you, as well, about the 60 day, 100% risk-free guarantee. You can actually go out and start reselling today and continue to resell for up to 60 days, keeping the profit. Really, the only risk is not trying and not securing a piece of the massive profits. You must order now while the price is the lowest, and the potential to earn is at its the highest. If you don't take action, trust me, your competition will. I'm proud of you for taking action and taking advantage of a unique opportunity, and I'm looking forward to seeing how much you're going to earn! As soon as you order, you'll immediately be able to download our resale rights package and start selling PopupReminder immediately! P.S. I've counted four different income streams you can have simultaneously working for you if you purchase the resale rights. I've listed all of them above. Can you name them?